The Andean civilizations made up a loose patchwork of different cultures that developed from the highlands of Colombia to the Atacama Desert. The most advanced civilizations were those of the Inca Empire and the Muisca people. There were other cultures in Ancient Peru and earlier cultures in Tiwanaku and the Norte Chico civilization. The Inca Empire was the last sovereign political entity that emerged from the Andean civilizations before the Spanish conquest. The Inca Empire was a patchwork of languages, cultures and peoples. The components of the empire were not all uniformly loyal, nor were the local cultures all fully integrated. For example, the Chimú culture used money in their commerce, while the Inca empire as a whole had an economy based on exchange and taxation of luxury goods and labor, and it is said that Inca tax collectors would take the head lice of the lame and old as a symbolic tribute. The portions of the Chachapoya culture that had been conquered were almost openly hostile to the Inca, and the Inca nobles rejected an offer of refuge in their kingdom after their troubles with the Spanish. Spanish rule ended or transformed many elements of the Andean civilizations notably influencing religion and architecture. The Norte Chico civilization (also called Caral) was a complex pre-Columbian society that included as many as 30 major population centers in what is now the Norte Chico region of north-central coastal Peru. It is the oldest known civilization in the Americas and one of the six sites where civilization separately originated in the ancient world. It flourished between the 30th century BC and the 18th century BC. 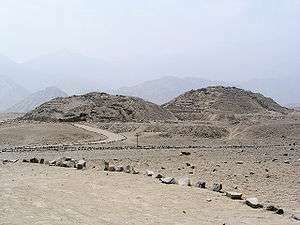 The alternative name, Caral-Supe, is derived from the Sacred City of Caral in the Supe Valley, a large and well-studied Norte Chico site. Complex society in Norte Chico arose a millennium after Sumer in Mesopotamia, was contemporaneous with the Egyptian pyramids, and predated the Mesoamerican Olmec by nearly two millennia. The Chavín culture in Peru is thought to have been primarily a religious cult. The culture apparently began in the Andes highlands and then spread outward throughout the country. The Chavín culture has very distinctive art styles, particularly in effigy pots, a number of which were in feline shapes. Chavin de Huantar was an important ritual centre for Chavin Culture, dating to around 1,500 BC. The Valdivia Culture is one of the oldest settled cultures recorded in the Americas. It emerged from the earlier Las Vegas culture and thrived on the Santa Elena peninsula near the modern-day town of Valdivia, Ecuador between 3500 BC and 1800 BC. The Nazca culture (also Nasca) was the archaeological culture that flourished from 100 to 800 AD beside the dry southern coast of Peru in the river valleys of the Rio Grande de Nazca drainage and the Ica Valley (Silverman and Proulx, 2002). Having been heavily influenced by the preceding Paracas culture, which was known for extremely complex textiles, the Nazca produced an array of beautiful crafts and technologies such as ceramics, textiles, and geoglyphs (most commonly known as the Nazca lines). They also built an impressive system of underground aqueducts, known as puquios, that still function today. The Nazca Province in the Ica Region was named for this people. 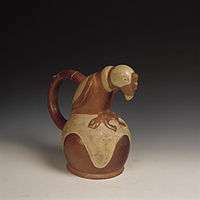 The Moche culture is world-renowned for its pottery, in picture a Condor from about 300 AD. The Moche civilization (alternately, the Mochica culture, Early Chimu, Pre-Chimu, Proto-Chimu, etc.) flourished in northern Peru from about 100 AD to 800 AD, during the Regional Development Epoch. While this issue is the subject of some debate, many scholars contend that the Moche were not politically organized as a monolithic empire or state. Rather, they were likely a group of autonomous polities that shared a common elite culture, as seen in the rich iconography and monumental architecture that survive today. They are particularly noted for their elaborately painted ceramics, gold work, monumental constructions (huacas) and irrigation systems. Moche history may be broadly divided into three periods – the emergence of the Moche culture in Early Moche (AD 100–300), its expansion and florescence during Middle Moche (AD 300–600), and the urban nucleation and subsequent collapse in Late Moche (AD 500–750). Tiwanaku (Spanish: Tiahuanaco and Tiahuanacu) is an important Pre-Columbian archaeological site in western Bolivia, South America. Tiwanaku is recognized by Andean scholars as one of the most important precursors to the Inca Empire, flourishing as the ritual and administrative capital of a major state power for approximately five hundred years. The ruins of the ancient city state are near the south-eastern shore of Lake Titicaca in the La Paz Department, Ingavi Province, Tiwanaku Municipality, about 72 km (45 mi) west of La Paz. The site was first recorded in written history by Spanish conquistador and self-acclaimed "first chronicler of the Indies" Pedro Cieza de León. Leon stumbled upon the remains of Tiwanaku in 1549 while searching for the Inca capital Qullasuyu. Some have hypothesized that Tiwanaku's modern name is related to the Aymara term taypiqala, meaning "stone in the center", alluding to the belief that it lay at the center of the world. However, the name by which Tiwanaku was known to its inhabitants may have been lost, as the people of Tiwanaku had no written language. The Chachapoyas, or the 'Cloud people', were an Andean civilization living in the cloud forests of the Amazonas region of present-day northern Peru. The Incas conquered the Chachapoyas shortly before the arrival of the Spanish in Peru. The first firm evidence of the existence of their existence dates back to around 700 AD, although it is possible that they built a settlement called Gran Pajáten where some ceramics have been dated to 200 BC. The largest Chacapoyan site discovered so far is Kuelap. A number of mummified burial sites have also been discovered. The Wari (Spanish: Huari) were a Middle Horizon civilization that flourished in the south-central Andes and coastal area of modern-day Peru, from about AD 500 to 1000. (The Wari culture is not to be confused with the modern ethnic group and language known as Wari', with which it has no known link.) Wari, as the former capital city was called, is located 11 km (6.8 mi) north-east of the modern city of Ayacucho, Peru. This city was the center of a civilization that covered much of the highlands and coast of modern Peru. The best-preserved remnants, beside the Wari Ruins, are the recently discovered Northern Wari ruins near the city of Chiclayo, and Cerro Baul in Moquegua. Also well-known are the Wari ruins of Pikillaqta ("Flea Town"), a short distance south-east of Cuzco en route to Lake Titicaca. The Chimú were the residents of Chimor, with its capital at the city of Chan Chan, a large adobe city in the Moche Valley of present-day Trujillo, Peru. The culture arose about 900 AD. The Inca ruler Tupac Inca Yupanqui led a campaign which conquered the Chimú around 1470 AD. This was just fifty years before the arrival of the Spanish in the region. Consequently, Spanish chroniclers were able to record accounts of Chimú culture from individuals who had lived before the Inca conquest. Similarly, Archaeological evidence suggest Chimor grew out of the remnants of Moche culture; early Chimú pottery had some resemblance to that of the Moche. Their ceramics are all black, and their work in precious metals is very detailed and intricate. The Inca Empire, or Incan Empire (Quechua: Tawantinsuyu), was the largest empire in pre-Columbian America. The administrative, political and military center of the empire was located in Cusco in modern-day Peru. The Inca civilization arose from the highlands of Peru sometime in the early 13th century, and the last Inca stronghold was conquered by the Spanish in 1572. From 1438-1533 AD, the Incas used a variety of methods, from conquest to peaceful assimilation, to incorporate a large portion of western South America, centered on the Andean mountain ranges, including large parts of modern Ecuador, Peru, western and south central Bolivia, northwest Argentina, north and north-central Chile, and southern Colombia into a state comparable to the historical empires of the Old World. The Muisca were the Chibcha-speaking people that formed the Muisca Confederation in the central highlands of present-day Colombia. They were encountered by the troops of Gonzalo Jiménez de Quesada, in name of the Spanish Empire at the time of the conquest in the spring of 1537. The Muisca comprised two confederations: Hunza (present-day Tunja) was located in the northern area, whose sovereign was the zaque; and Bacatá the southern area, whose sovereign was the zipa. Both confederations were located in the highlands of modern-day Cundinamarca and Boyacá (Altiplano Cundiboyacense) in the central area of Colombia's Eastern Ranges. Timoto–Cuica people compromised primarily of two tribes, the Timotes and the Cuicas, that inhabited in the Andean region of western Venezuela. They were closely related to the Muisca people of the Andes, who spoke a Chibcha language. The Timoto-Cuicas were not only composed of the Timoto and the Cuica tribes, but also the Mucuchíes, the Migures, the Tabayes, and the Mucuñuques. Timoto-Cuica society was complex with pre-planned permanent villages, surrounded by irrigated, terraced fields. They also stored water in tanks. Their houses were made primarily of stone and wood with thatched roofs. They were peaceful, for the most part, and depended on growing crops. Regional crops included potatoes and ullucos. They left behind works of art, particularly anthropomorphic ceramics, but no major monuments. They spun vegetable fibers to weave into textiles and mats for housing. They are credited with having invented the arepa, a staple in Venezuelan and Colombian cuisine. ↑ "Sacred City of Caral-Supe". UNESCO. Archived from the original on 15 June 2011. Retrieved 2011-06-09. ↑ "Chavín de Huántar, Peru - A Pre-Columbian World Heritage Treasure". Global Heritage Fund. Retrieved 12 October 2011. ↑ "Chavin Culture". About.com archeology. Retrieved 12 October 2011. ↑ Beck, Roger B.; Black, Linda; Krieger, Larry S.; Naylor, Phillip C.; Ibo Shabaka, Dahia (1999). World History: Patterns of Interaction. Evanston, IL: McDougal Littell. ISBN 0-395-87274-X. ↑ Kolata, Alan L. (December 15, 1993). The Tiwanaku: Portrait of an Andean Civilization. Wiley-Blackwell. ISBN 978-1-55786-183-2. Retrieved 9 August 2009. ↑ Kelley, David H.; Milone, Eugene F. (November 19, 2004). Exploring Ancient Skies: An Encyclopedic Survey of Archaeoastronomy. Springer. ISBN 978-0-387-95310-6. Retrieved 9 August 2009. ↑ Hughes, Holly (October 20, 2008). Frommers 500 Places to See Before They Disappear (500 Places). Frommers. p. 266. ISBN 978-0-470-18986-3. Retrieved 9 August 2009. ↑ "Profile: Fabricio R. Santos - The Genographic project". Genographic Project. National Geographic. Archived from the original on 2011-07-05. Retrieved 2009-08-09. ↑ "The Chachapoyas Culture of Peru". Wordpress. Retrieved 24 October 2011. Besom, Thomas. Of Summits and Sacrifice: An Ethnohistoric Study of Inka Religious Practices (University of Texas Press; 2010) 230 pages; combines archaeological and textual data in study of practices of human sacrifice and mountain worship. Burger, Richard L. Machu Picchu; Unveling the Mystery of the Inca. Yale University Press, 2004. Conrad, Geoffery. Religion and Empire; The Dynamics of Aztec and Inca Expansionism. Cambridge University Press, 1984. Eeckhout, Peter. Ancient Peru's Power Elite. National Geographic Research and Exploration. March 2005. Pp. 52–56. Frost, Peter. Lost Outpost of the Inca. National Geographic. February 2004. Pp. 66–69. Malpass, Michael A. and Sonia Alconini, eds. Distant Provinces in the Inka Empire: Toward a Deeper Understanding of Inka Imperialism (University of Iowa Press; 2010) 355 pages; Research on Inca conquest in the central and northern coasts of Peru, in Ecuador, and in other regions far from Cuzco. Prescott, William H. Conquest of Peru. The Book League of America. New York: 1976. Reinhard, Johan The Ice Maiden: Inca Mummies, Mountain Gods, and Sacred Sites in the Andes. Washington, D.C.: National Geographic Society, 2005. Rostworowski de Diez Canseco, Maria. History of the Inca Realm. Cambridge University Press, 1999.